Scrap metal is classified as either ferrous or non-ferrous scrap. While ferrous metals contain some degree of iron (its name derived from the Latin term meaning iron), non-ferrous metal does not contain iron as a component. Non-ferrous metals were the first metals used by humans for metallurgy. Copper me be forged. It was soft enough to be fashioned into various objects by cold forging and could be melted in a crucible. Gold, silver, and copper replaced some of the functions of other resources, such as wood and stone, owing to their ability to be shaped into various forms for different uses. Due to their rarity, these gold, silver and copper artifacts were treated as luxury items and handled with great care. The use of copper also heralded the transition from the Stone Age to the Copper Age. The Bronze Age, which succeeded the Copper Age, was again heralded by the invention of bronze, an alloy of copper with the non-ferrous metal tin. In terms of ferrous metal, steel, an iron alloy, is the most recycled material both in the United States and globally. Scrap metal can be further categorized as either obsolete or prompt scrap. Sources of obsolete ferrous scrap include automobiles, steel structures, household appliances, railroad tracks, ships, farm equipment as well as other sources. 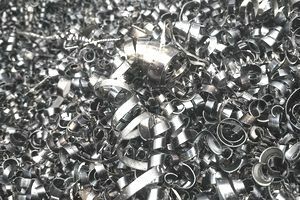 Prompt scrap, also known as prime or new scrap, is generated as a by-product of industrial and manufacturing activities such as stampings, turnings, and clippings. Prompt scrap accounts for approximately half of the ferrous scrap supply. This scrap is processed by the scrap recycling industry into commodity grade material that accounts for more than 60% of the total amount of raw steel produced in the United States. Such processing typically takes place at electric arc furnaces. As well, the U.S. exports ferrous scrap to approximately 90 countries around the world. Generally speaking, ferrous alloys are magnetic, although their magnetic attraction will vary as a consequence of the amount of iron in the alloy. Stainless steel is considered to be a ferrous metal but is not always magnetically attracted because a great deal of the iron is removed in the manufacturing process. EPA estimated the generation of scrap ferrous metals at 18.2 million tons in 2015 (6.9% of total MSW generation). EPA estimated the recycling rate of all materials in appliances, including ferrous metals, was 61.7%. Overall, the Agency estimated the recycling of ferrous metals from durable goods (large and small appliances, furniture, and tires to be 27.8% (4.4 million tons) in 2015. EPA estimated the recycling rate for steel cans to be 71.3% (1.2 million tons) in 2015. Through the utilization of ferrous scrap rather than virgin materials in the production of iron and steel, CO2 emissions are reduced by 58%. It may be that nonferrous scrap makes up a small percentage of the total quantity of material recycled in the United States, but by value, it accounts for more than half of total U.S. scrap recycling industry performance, approximately $32 billion in 2015. This was achieved by the processing eight million metric tons of nonferrous scrap, generated from a range of consumer, commercial and industrial sources, including copper and precious metal circuitry in electronic devices, soft-drink containers, automobile batteries and radiators, aluminum siding, airplane parts much more. Recovered nonferrous scrap, including aluminum, copper, lead, nickel, tin, zinc and others, is consumed by secondary processors in the U.S. as well as in more than 100 countries worldwide. Nonferrous metals do not degrade or lose their chemical or physical properties in the recycling process, resulting in their capacity of being recycled an infinite number of times.